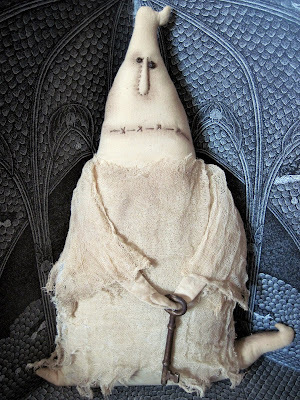 Each October, one of my favorite primitive doll artists makes another batch of fantastic Halloween pieces. This hand sewn and delicately aged muslin ghost just drifted in. He holds a rusty old key; perhaps it unlocks the tomb behind him. ooohhh! i adore ghostly! so u like prim dolls too?! we are birds of a feather :) pray tell who the prim artist is? Great little ghost guy. He looks a little confused. Must be trying to find the lock for that key. I came across your blog and found my pattern designs! Jane always does a great job. You can find the patterns through my blog~ staceymead.blogspot.com ~ these are some of my favorites~ how fun to see them! How fun to see my designs out and about! Jane does a great job with them! You can find the patterns through my blog, staceymead.blogspot.com Love how these turned out! Hi Stacey! Your dolls are fab, and yes, Jane does a great job with them: she is my very favorite prim maker!